Core Strengthening - The movement created by the BALANCE Mechanism strengthens the core muscles as they respond to compensate for every movement of the body as the user leans and shifts. This movement also ensures that the muscles are in constant action as they work to ensure that the user remains completely stable on the Amazone seat. This movement can also be employed to a greater extent to consciously exercise the core by having the user train themselves to actively shift and counterbalance throughout the course of the day. The level of resistance to movement can be adjusted to personally preferred levels. Freedom of Movement - Saddle Seats such as the Amazone encourage the entire upper body to move more freely than a traditional chair. In the absence of side or back constraints users are able to freely lean, stretch, and arch as they wish. This freedom translates into improved back mobility as it remains in constant flex. The upward stance of this style of seat also increases alertness as the entire body becomes involved in the sitting experience. Correct Spinal Alignment (Improved Posture) - Score Saddle Seats are designed to restore the correct alignment of the spine. This is accomplished when the pelvis is tipped forward due to the 45° downward angle of the thighs. The forward tilt of the pelvis restores the natural "S-Curve" of the spine, positioning it where it can best provide the support necessary for the torso, neck and head. Traditional chair seats actually force the lumbar portion of the spine outward (creating a "C-Curve"), exerting unnatural and unsupported stress on the soft tissue muscles and ligaments of the lower back. The improved alignment of the spine which the saddle seating promotes alleviates or removes that stress, reducing fatigue by enabling those tissues to relax and rest. The "Balance" mechanism on the Amazone Balance offers a greater degree of comfort as it permits the seat to follow the body as it moves. 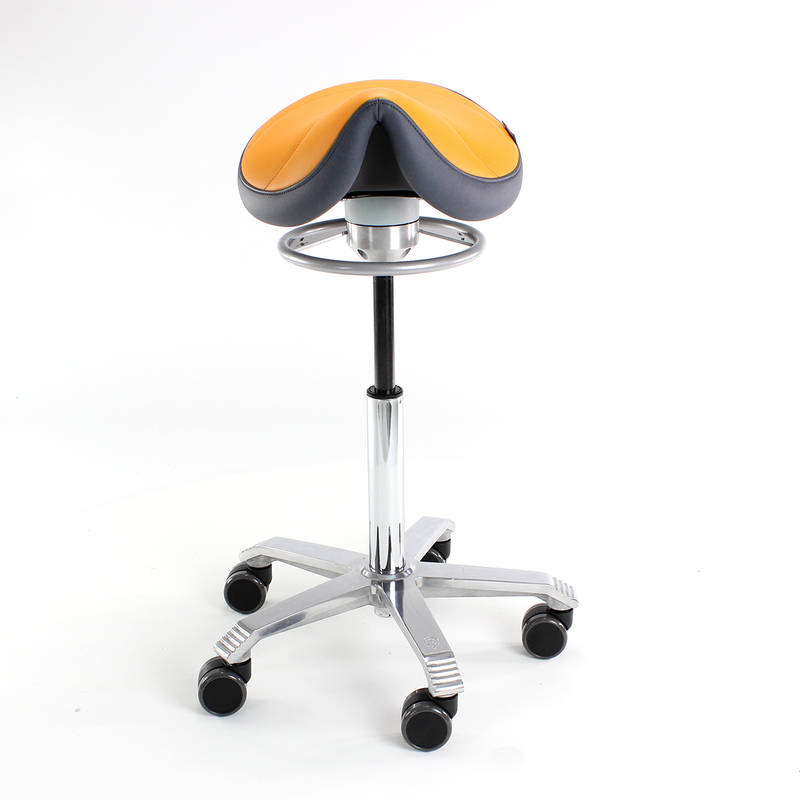 Ability to Deviate from Upright Position Securely - For users such as Dentists or Chiropractors saddle-style seats can provide a significant posture improvement over other types of seating. This is due to the anatomical position yielded by a correctly positioned saddle seat, angling the thigh downwards rather than directly in front of the user (i.e. 90°). The enables the practitioner to move significantly closer to the patient, hovering over them while maintaining a stable seating posture. This ability to "move in" enables them to maintain a more upright posture which in turn reduces the strain on the lower back - an issue which is common in both of these groups or anyone else who performs repetitive forward or side-reaching tasks. The constant subtle movement of the Balance mechanism makes this movement even more natural as the seat moves with the user, further extending the reach. It also enables them to exert greater force when necessary while at the same time reducing the effort required. The closer positioning also provides users with a greater degree of hand and finger control since the arms can be held closer in to the body in a more neutral position. Reduced Potential for Lower Back Pain - By positioning the spine in its naturally strongest and correctly aligned position the continuous tension and stress which traditional chairs place on the lumbar portion of the spine is relieved. Much back pain is a response generated by the soft tissues (muscles, ligaments, etc) to notify us that overuse, overstressing, or damage has been done to these tissues. This is a natural response by the body in an effort to advise us that something needs to be addressed. Ligaments and muscles are not designed to be held in constant tension. Over time ligaments lose their resiliency and are unable to return to their natural length (much like a rubber band will lose its original proportions once it is repeatedly stretched or held in an extended position). This will result in a greater stress on the muscles which are now required to exert extra continuous effort in order to aid the ligaments in providing the necessary support. Associated with this extra stress, muscles will often respond with cramping and spasms, usually accompanied by pain. Reduced "Overreach" - A complaint commonly associated with traditional seating is that it is difficult to reach items positioned to the sides or front. Doing so requires a significant rotation forward or outward from the shoulder, often combined with a forward bend from the waist. This can be a cause for concern for two reasons. First, the extreme reaching of the arms and the high degree of rotation necessary to accomplish this can lead to the development of shoulder-related issues. Usually this is addressed by trying to adapt the work area to the user by bringing frequently used items and equipment closer. However, there is always a limitation to dimensions of the comfort zone so this is usually only partially effective as a solution. The second area of concern related to the overreach is that when items are out of reach users will attempt to extend the limited range of their arms by "bending" or "stretching" forward from the waist. This exerts unnatural and unnecessary stress on the lower back, increasing the potential for development of lower back pain. An Amazone Balance seat addresses both of these concerns by providing a significantly increased reaching zone. The forward tilt of the pelvis immediately provides several inches of additional forward reach that cannot be available when seated in a traditional chair as the upper body is brought into closer proximity to the work space. In combination with this is the fact that a saddle seat position permits the entire torso to accomplish the reach, rather than relying on a single joint such as the shoulder. By spreading the reaching movement throughout the upper body not only are users able to reduce the angle of the shoulder rotation but also the potential for stress on the lower back. The result of this is that the reach of an average user can easily and comfortably be extended 12" - 18" beyond what they could normally reach from a traditional chair. 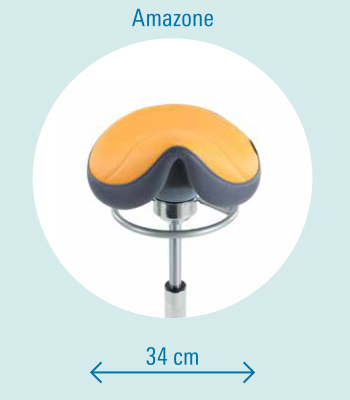 Achieve Sit/Stand Benefits WITHOUT Standing - Due to the unique posture and active seating position that the Amazone Balance offers, the user is able to realize many of the benefits attributed to an active standing posture without some of the accompanying concerns. The rocking motion of the seat can improve core muscle tone, posture is improved, blood flow is increased due to the greater degree of movement offered, and improved overall abdominal activity due to the open and upright stance ensures improved bloodflow and increased metabolism. This automatically results in a greater degree of alertness and the ability to better focus on the tasks at hand. Avoids the Risk Factors of Standing When Working - Standing to work is rapidly gaining in popularity due to solid scientific evidence that extended sitting in the traditional office environment greatly increases numerous health risks. Current media coverage which is to a great extent fuelling this movement has almost solely focused on the "benefits" of standing to work, ignoring the equally compelling evidence that extended standing can also be extremely detrimental to one's overall health. Studies have shown that extended standing can result in blood pooling in the lower legs due to the static state of the leg muscles, resulting in edema (swelling of the feet and lower legs) and a corresponding increase in varicose vein problems. This also increases the load on the circulatory system which has to push this pooled blood back out of the legs. There is good evidence that this can exacerbate existing or possibly lead to heart and circulatory problems. Many people who stand extensively, especially on hard floors (concrete, ceramic tile, etc), develop heel problems that can manifest as bone spurs or plantar fasciitis. Standing is also more tiring, something which is has been well-known in industry for many years. While standing does burn more calories it is also rated to consume 20% more energy than sitting which can result in fatigue. Industry has addressed this by providing anti-fatigue mats, anti-fatigue footwear, and chairs to sit on during rest breaks - each of which is aimed to reduce the tiring effects of standing. 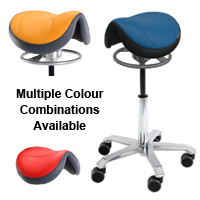 Score Saddle Seats enable users to maintain the upright posture which is most beneficial to their health while at the same time reducing their exposure to the risk factors described above. Since the Saddle Seat carries the majority of the weight load the leg muscles are no longer required to remain in "tension" mode in order to support the user. Instead, these muscles are now free to relax and flex as needed to move the chair around the work area. This movement activates the "pumping action" that aids in moving blood from the lower legs. By transferring the majority of the weight to the Saddle Seat, the feet are also permitted to rest, reducing the ongoing strain that occurs with extended static standing. IMPORTANT NOTE - IMPORTANT NOTE - Working in a Saddle Seat will generally require some modifications to the workstation. Since it elevates the torso of the user there will be a requirement to ensure that keyboard, mouse and monitor are all able to be brought into an appropriate height position in order to maintain a neutral posture for the hands, arms, and neck. For average or shorter users this might be able to be accomplished by elevating the desk using specialized lifters such as Raise-Its which can safely raise a desk by up to 3". Standard keyboard arms and trays may also provide enough elevation or may be utilized in combination with a product like the Raise-Its. The monitor mount may have enough range to elevate the screen to the desired greater height or a few simple monitor risers in combination with its integral movement may provide the necessary elevation. For more complex scenarios such as taller users it may be necessary to provide an elevating workstation that can be raised enough to bring these devices into the correct alignment. The advantage that a Saddle Seat offers over a Sit/Stand workstation is that the user is still in a seated position and the monitor and keyboard do not need to shift throughout the day as the range of motion and viewing angles do not change. In order to properly equip a true Sit/Stand Workstation it would need to accommodate the changes which occur when the user switches from Sitting to Standing. These include small but significant changes in the hand/arm positions and more significant changes in the viewing angle required for the monitor. This may often require a monitor arm with a fairly wide range of elevation adjustment, adding additional cost to the adaptation. Adjustable Height Options: Three different height options are available - enabling the Amazone Balance to meet the seating heights of users ranging from 4' to 6'5" or over. Standard: fits 5'3" to 6'1"
Adjustable Movement: The range or resistance of the rocking motion which the Balance Mechanism provides is easily adjusted by a few turns of the adjusting ring located directly below the seat. Easy Rolling: The polished aluminum base is equipped with easy-rolling 65mm soft casters for hard floors. For safety these are braked casters which means that the seat remains in position when unoccupied but rolls freely when weight is placed on the seat. 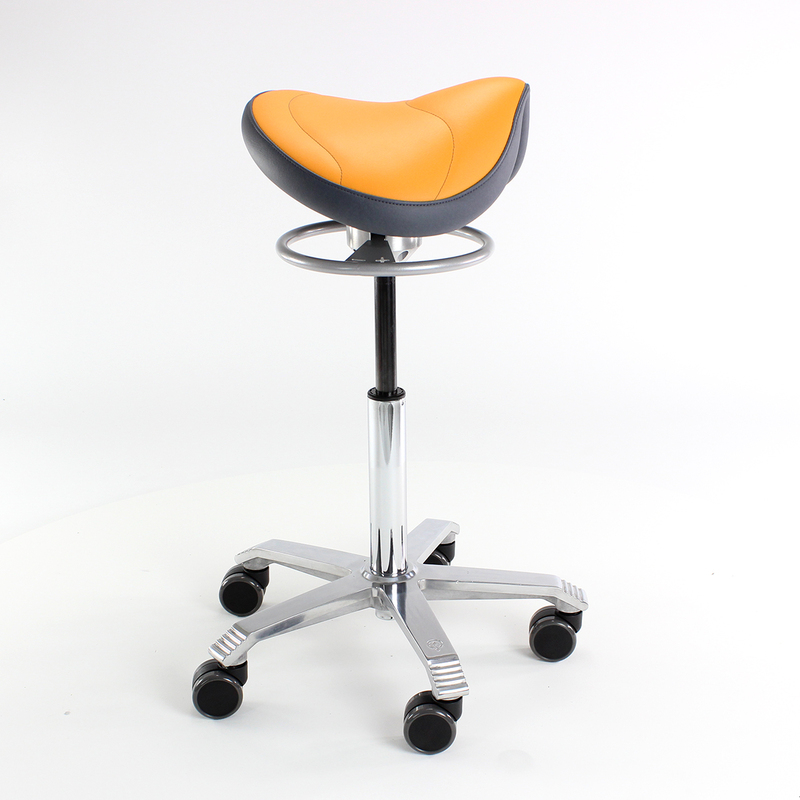 The Saddle Seat Design means users can use their feet in a push/pull motion to maneuver around a work area with minimal effort.